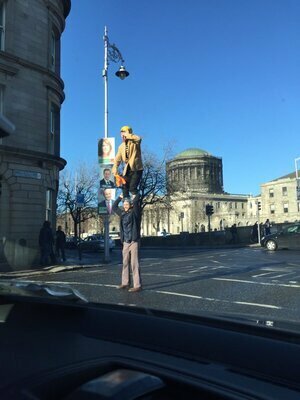 In Dublin today at the traffic lights…beats unwanted washing of your windscreen. 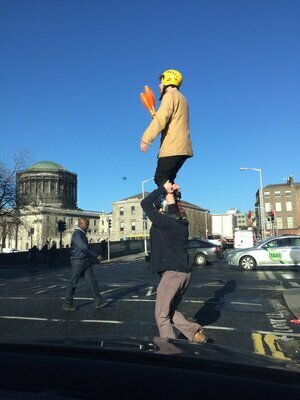 Posted in Misc and tagged Dublin, juggling, traffic lights at 2:54 pm on February 10, 2016 by Broadsheet. One of the blokes looks like he’s standing on top of the other bloke. I hope nobody got hurt, unless it was Leather Jacket Guy. I see any criticism of b.s. is automatically deleted these days. No decent free speech but we have to put up with l.j.g. No free speech? What, were you arrested as well? I’m not sure what you are on about. You are free to say what you like. Broadsheet deleting your comments doesn’t affect your freedom of speech. They are the publishers so when you post here, they are the ones speaking and they are free to delete it because they are responsible for it. Who were you throwing expletives or personal insults at? As far as I can tell, from my own numerous deletions of my ranting is that when you cross the line and get personal you get deleted. And I think that’s fair enough, and sometimes I’m glad they deleted my stupid comment…. so, I’d hazard a guess you may have got personal, no? maybe? Can you fix the issue with the replies to comments, please? Or at least acknowledge it? Very sorry Malta, we are on it. Good lads! I prefer the app by far. Carnies! Circus folk for sure, members of the Dublin Circus Project. Performing circus arts at traffic lights is a popular well recieved thing. 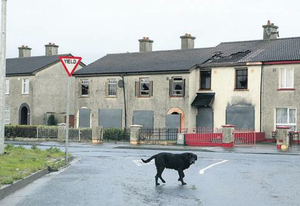 I really like the location, Merchants Quay, it’s nice to see something of that nature in the area.